Thank you Rio Luna Organic Peppers for sponsoring this post. Rio Luna Organic Peppers are certified organic, non-GMO, fat free, cholesterol free, low calorie and Kosher. For flavorful and spicy recipe ideas follow Rio Luna on Facebook and Instagram. This jalapeño cilantro hummus is the perfect appetizer for holiday parties or for weekday afternoon snacking! Low in carbs, this hummus is vegan, grain free, gluten free, paleo and Whole30 friendly. 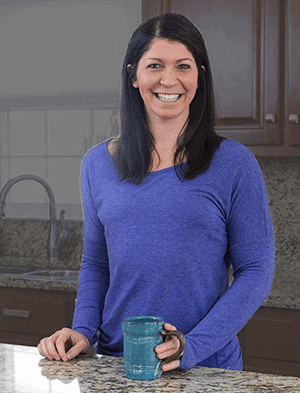 Entertaining over the holidays is a fantastic time to get creative in the kitchen! 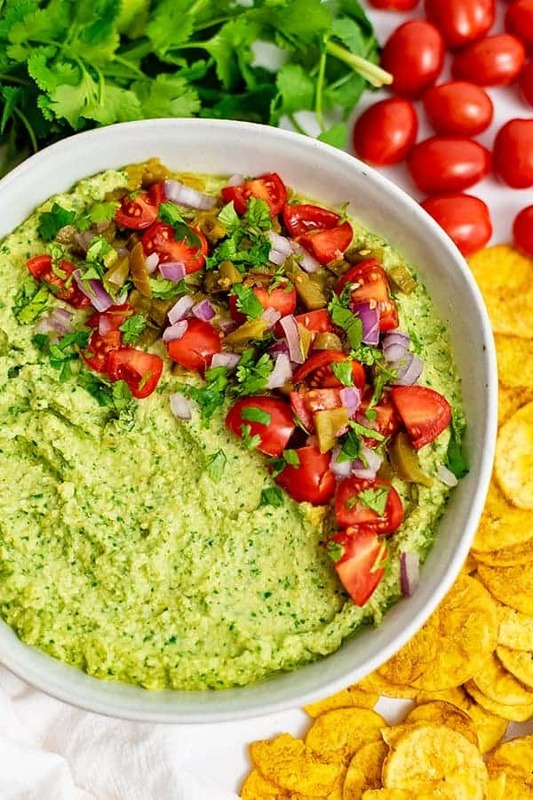 This jalapeño cilantro hummus adds the perfect spicy punch needed to create a memorable, healthy appetizer for any party you are hosting over the holidays! 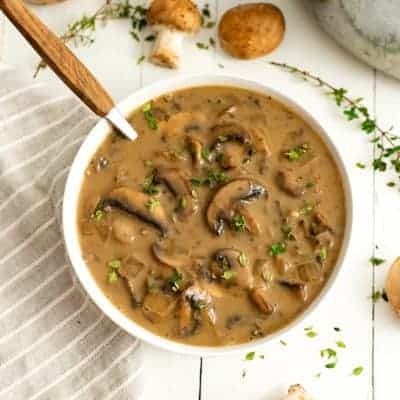 Even if you are not hosting a party, one of my favorite ways to make sure I have something healthy and delicious to snack on at a party is to volunteer to bring a dish. And one of my favorite go-to appetizers to bring is homemade hummus, because it’s so simple to make and incredibly delicious. 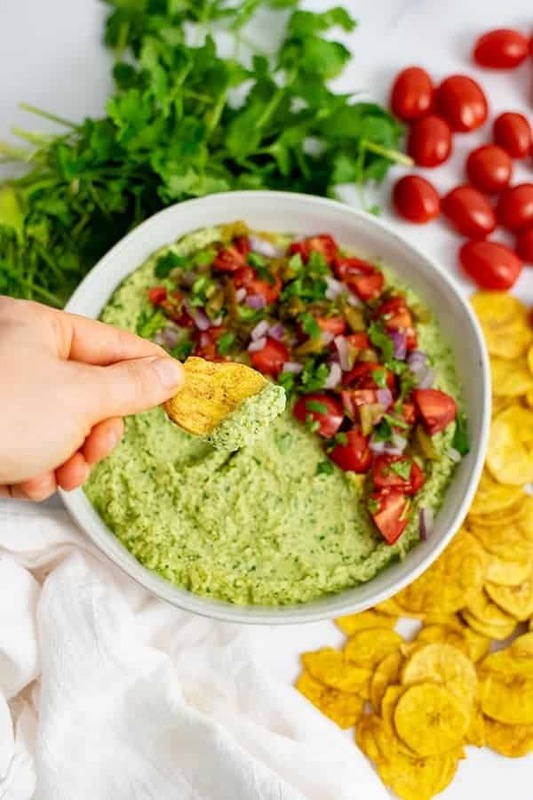 Once there is a bowl of this jalapeño cilantro hummus on the table at a party, it is sure to be one of the first dips to disappear, it’s that delicious! I personally love to serve this jalapeño cilantro hummus with sliced vegetables and plantain chips! And the best news is: unless you tell people, no one will know that this hummus is healthy or made from vegetables! What makes this hummus perfect for parties or weekday snacking? 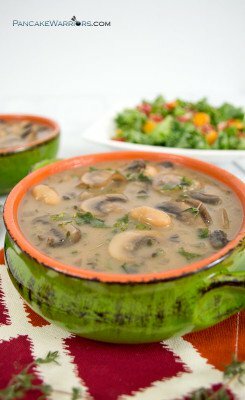 It’s packed full of vegetables, healthy fats, and my personal favorite, it’s got a little kick from the jalapeños! Unlike traditional hummus that is made with chickpeas, I made this jalapeño cilantro hummus with artichoke hearts, making it lower in carbs, paleo and Whole30 friendly. 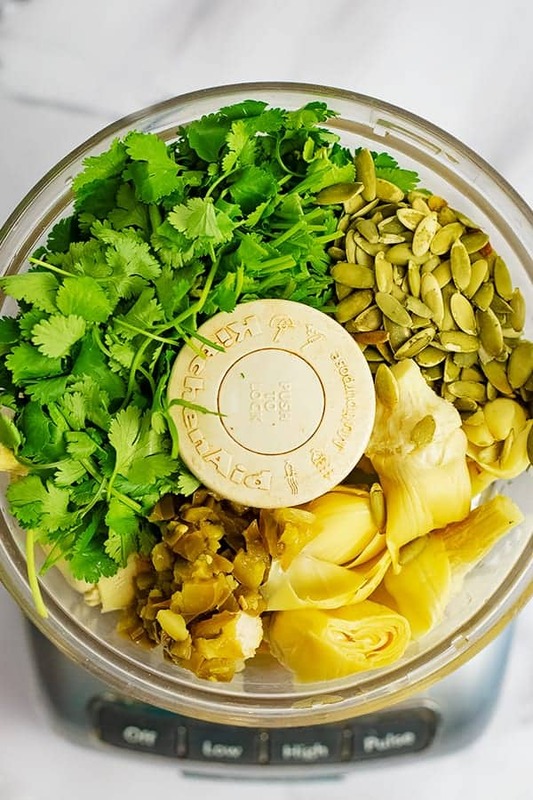 The reason that I chose to make this hummus with artichokes instead of chickpeas is because Dave and I both have trouble digesting chickpeas, so I don’t add them into our regular diet. 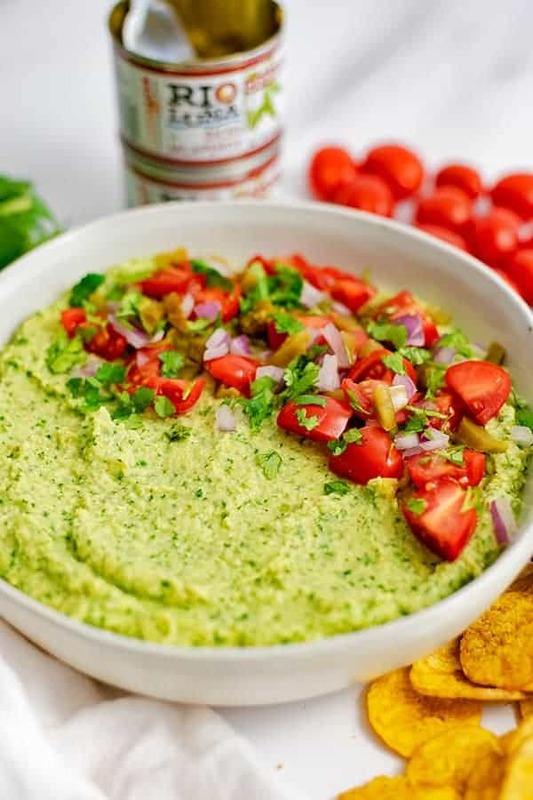 What do you need to make jalapeño cilantro hummus? I love the kick the Rio Luna Organic Diced Jalapeño Peppers adds to this hummus. 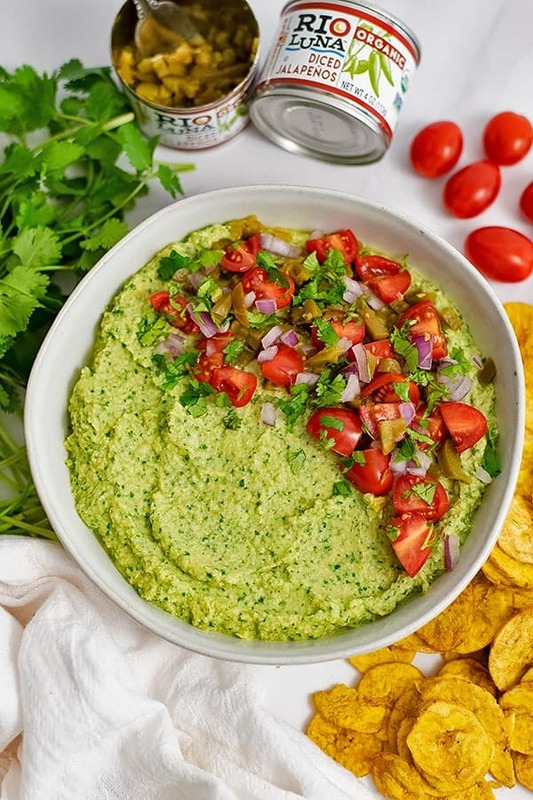 They add a slight kick but aren’t too spicy, which makes this jalapeño cilantro hummus perfect for a party! If you don’t have a few cans of Rio Luna Organic Diced Jalapeño peppers in your pantry right now, you are missing out! Keep an eye out for the new Non-GMO approved stamp and heat index meter! You will notice from the can, they are hot but not super spicy! Rio Luna peppers are certified organic, non-GMO, fat free, cholesterol free, low calorie, Kosher, and are so much easier to use than a fresh jalapeño. I often struggle with fresh jalapeños, as I’ve been known to accidentally burn my eyes with my fingers after chopping fresh jalapeños. Needless to say, I was so happy to find these canned organic jalapeño peppers to use instead. This way I don’t have to worry about chopping or cutting or burning my eyes with my fingers, since Rio Luna peppers are the highest quality organic peppers as they’ve been used by professional chefs for years! Be sure to visit the Rio Luna Organic Peppers site here for coupons to purchase at Kroger or Whole Foods! Here is a pro-tip to make this hummus even easier to make! Pick up a bottle of organic lime juice instead of juicing the limes yourself. You can divide the leftover lime juice into ice cube trays 1 tablespoon at a time so you can have this on hand anytime of the year! Although I don’t expect you to have any left-overs after a party, this jalapeño cilantro hummus only takes 2 minutes to make and since the ingredients are so easy to have on hand at any time, you can easily make this hummus for your weekday snacking as well! Hummus can be used in place of mayo, ranch dressing, guacamole or salsa, as it’s full of flavor and can make an ordinary sandwich extraordinary! Drain the water and rinse the artichoke hearts. Add the artichokes to the food processor. Add the cilantro leaves, lime juice, salt, garlic olive oil, pumpkin seeds and 3 tbsp of the diced jalapeños to the artichoke hearts. After the artichoke mixture is smooth, add it to a bowl. 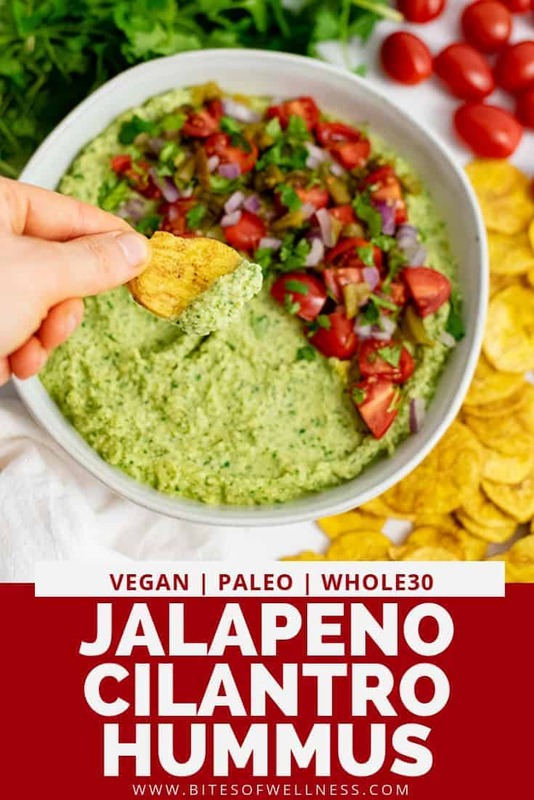 Top the jalapeño cilantro hummus with the remaining diced jalapeños, red onion, chopped tomatoes and serve with vegetables or your favorite chips. I’m obsessed with hummus! I make it all the time and am always trying to come up with creative flavors to put in it so that I don’t get bored. I also happen to be obsessed with Mexican food, so this sounds like the perfect flavor combination! I can’t wait to make it!